Goal is to introduce children to the French language and to gain knowledge of basic vocabulary, phrases and expressions. The children learn language naturally in very young age and they have a great capability to learn more than one language. Our new expanded French curriculum consists from two segments. One part is when common daily conversation is performed in French and also children are instructed mostly in French. Teachers avoid any instructions in English and using gestures, mime, intonation, pictures, and objects to convey meaning as the situations are meaningful and have a clear purpose. At the beginning, children will not understand everything the teacher says but the use of nonverbal communication induces and helps the comprehension. They will also find ways to understand by watching teacher's and their peers' reactions. Children might also simply accept the fact that they sometimes do not understand and they won't be bothered by it at all. Classes are 30 minutes in length and are currently taught three times a week, in a group instruction form. Work and activity sheets are sent home on monthly basis with a report indicating student's progress. We are proud to subscribe National Geographic Magazine, National Geographic Little Kids Magazine and National Geographic Kids Magazine. These wonderful magazines present the numerous interesting areas of our life, such as beauty of nature, habits of animals and wonders of the world. The simple stories, accompanied with the typical spectacular pictures, are intriguing and ignite the natural curiosity in young children as well as cultivate their respect for nature. 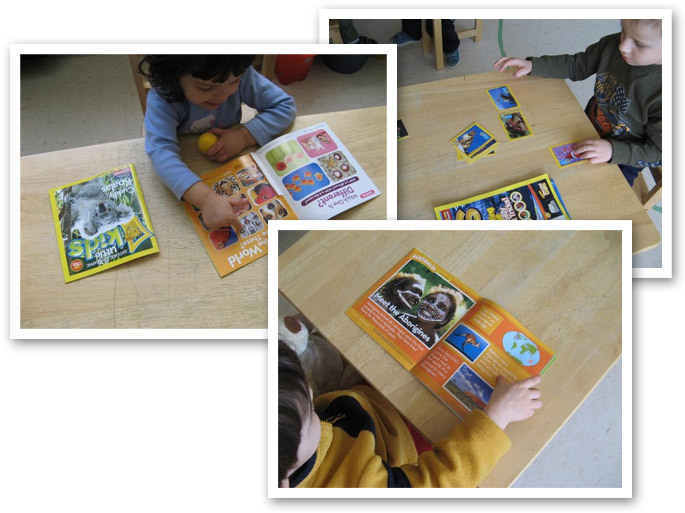 Kids in both our classrooms love to browse through their magazines, complete simple tasks and discuss the topics with their peers as well as teachers. Spring is the perfect time to learn about living things and we begin the learning process with hatching chickens in an incubator. Hatching chicken eggs is a common science experiment in the classroom. The aim of this program is to show the children how a chicken life begins. 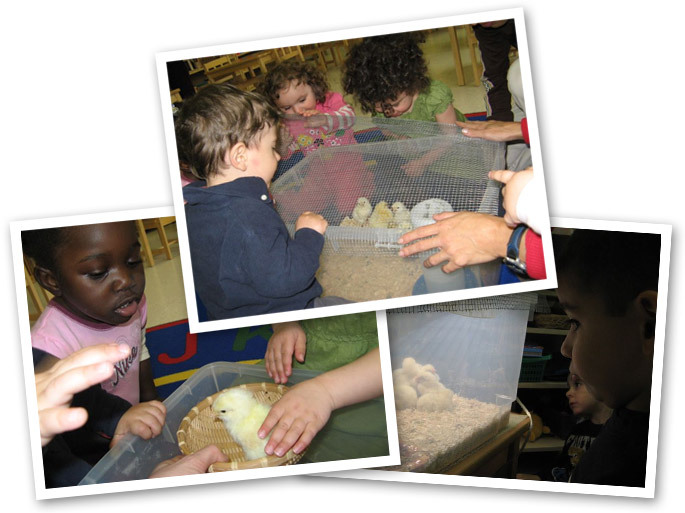 Children can learn a lot about nature and the growth process by watching chicken eggs hatch. It gave the children an amazing experience of a real life cycle. They, in particular, love to see the chicks pecking their way out of their eggs from the sound of the first tap, tap, tap... Children will see the amazing transformation from a wet and weak chick to a cute fluffy chick. It's a truly heart-warming experience. The teacher likes to use yoga in the classroom to calm down children, change the outdoor energy and dynamic movement into calming and concentrating mind of the children. Yoga creates atmosphere of peace and concentration in the classroom and helps children to relieve the stress. Children use natural movement and imagination. Yoga helps them to understand themselves from inside. We use drama activities and themes almost every day. Children love to pretend, sing, dance and express themselves. Drama helps children to be become better listeners, develop communication skills and express themselves freely. It also helps them to develop their coordination. Children are getting motivated to learn and taking learning as a fun activity. Drama helps children also to release the stress and better understand the emotions. We are regularly preparing the interesting Winter and Spring concerts.